We had a major step forward on Thursday when Andrew Goodman and RSS lifted the locomotive chassis and the wheels were rolled out. See pictures by Peter Giroux – there’s 58 good photos in the collection. At 10:00 we had a tea ceremony to compete with Grosmont. 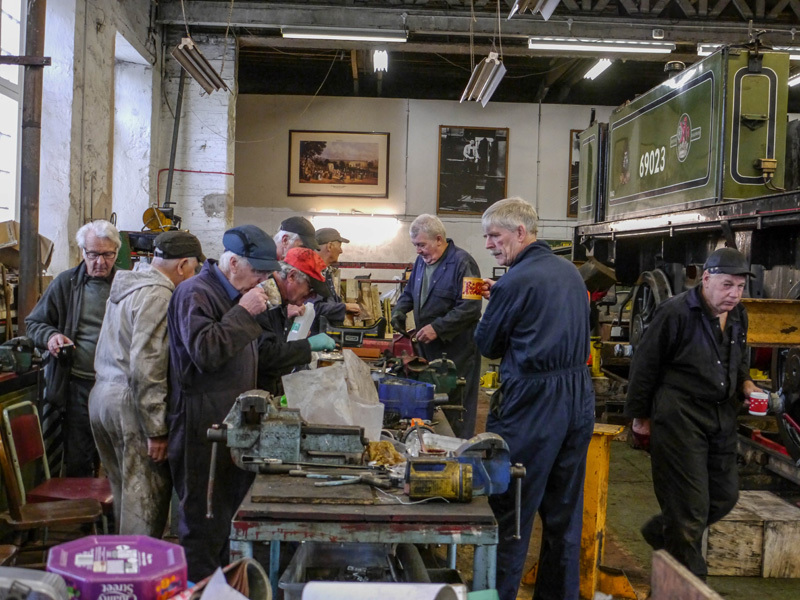 In the second photograph the eagle eyed of you may notice that in the photo of the leading wheel set being removed, behind Steve Hyman and Roy Marshall is one of the front buffers which have already been removed. Harry Sams and Steve Gibson are well on with the removal of the front buffer beam to give access to the cylinders and valves. So, with the wheels out there’s now plenty to do at all skill levels.